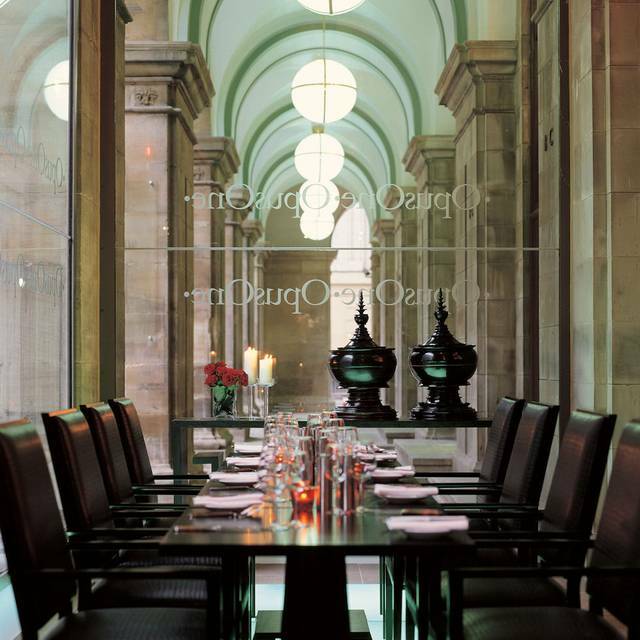 You must make bookings at least 5 minutes in advance of the time at Afternoon tea at the Birch Room. 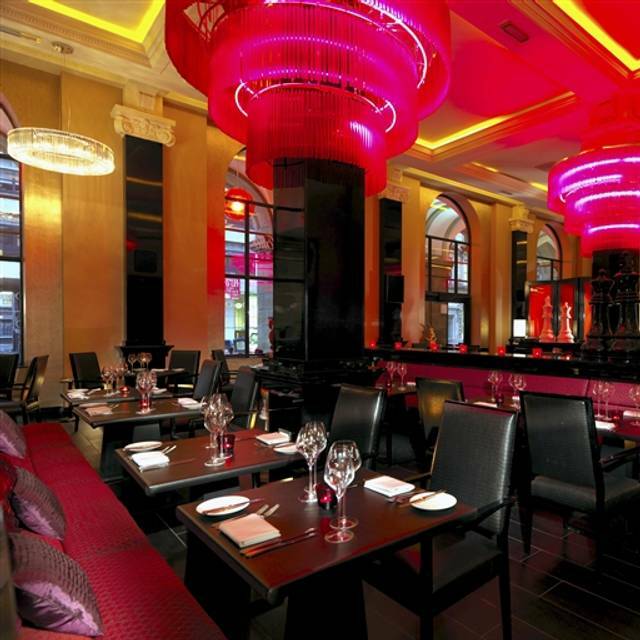 Function rooms available for private parties at Radisson Blu Edwardian Manchester at Free Trade Hall. 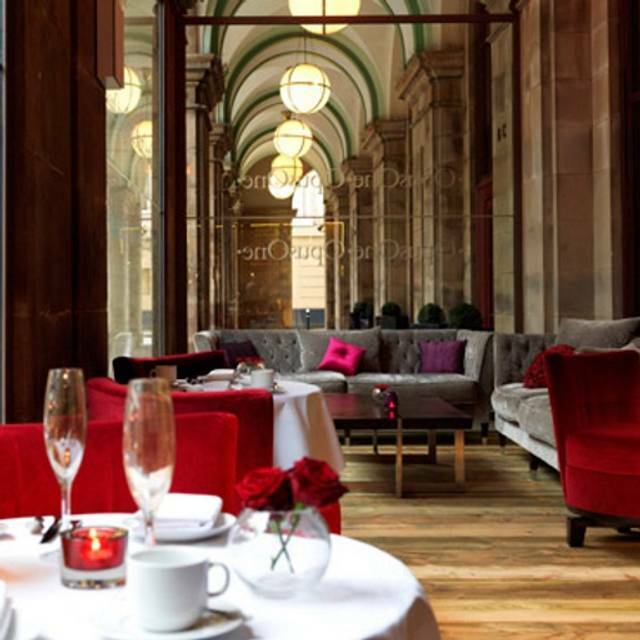 Experience a unique French-inspired High Tea at the 5-star Radisson Blu Edwardian, Manchester Hotel. 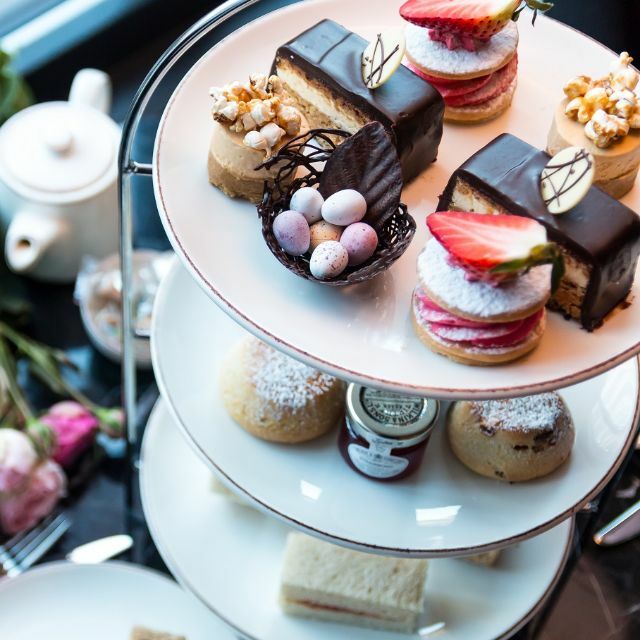 Guests will dine in the stylish surroundings of The Birch Room, with a High Tea featuring exquisite pâtisserie selections, freshly baked scones, homemade finger sandwiches and much more. 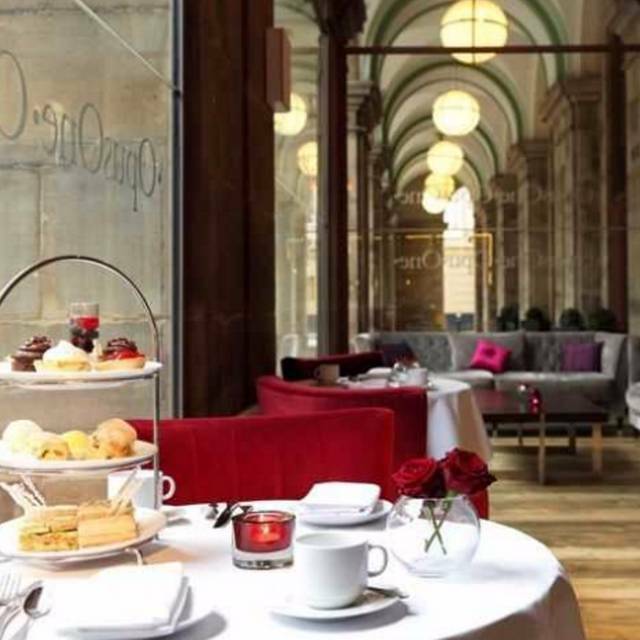 Situated in the city centre’s stunning Free Trade Hall, the Grade II listed property is the perfect place to enjoy the longstanding tradition of High Tea. Was disappointed there was not a gentleman's afternoon tea. The sandwich fillings were not good. The cakes were too big and gaudy colours. The room is not as nice as the previous one. Was really disappointed as was looking forward to coming as was fantastic last time. Sorry for the negative response but really didn't think it was good value. On the plus side, the staff were friendly and welcoming here. The warm scones were good but could have been slightly larger (like normal scones). The sandwiches however were very poor as the bread was dry and some of the fillings were quite sparse between the slices of bread - the classic cucumber with beetroot cream cheese on tomato bread (for example) had hardly any beetroot and cream cheese on it. We mentioned about the dry bread issue when paying for the Afternoon Tea - but not much of a response came back or offer of any compensation. The selection of cakes looked very 'artisan' but were very sweet. Some were quite sickly sweet. The little nest with the chocolate eggs inside was probably the best of the cakes. This Afternoon Tea was quite expensive for what it was (£56 for 2 people) - this included a pot of tea or a cup of coffee (which they would top up on request). My rating is based on this Afternoon Tea is of poor value. 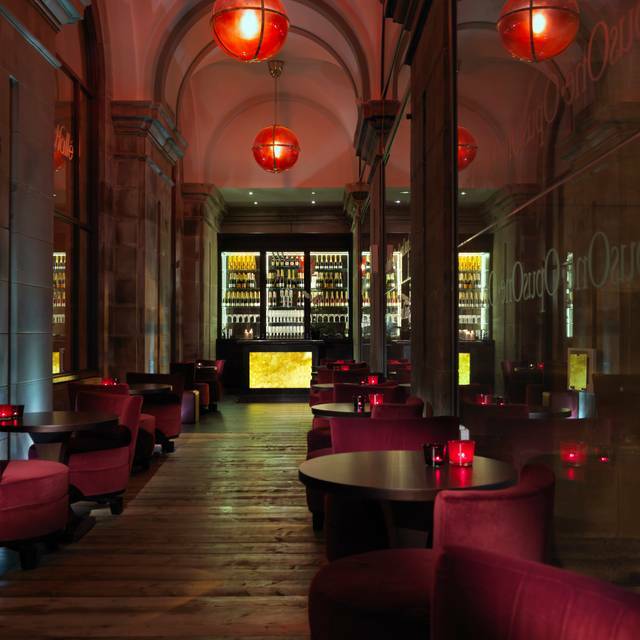 The attentiveness of the staff over the teas and coffee's and the relaxing feel of the birch room where we dined were the only plus points of the experience. So overall not what we hoped our Anniversary Afternoon Tea Celebration was going to have been. The food and service was excellent. When the afternoon tea arrived we were delighted with the array of choices. I would only say they do need to invest in some small cake boxes as I was unable to finish mine and wanted to take some home. They were very good though and wrapped them in some cellophane bags in a small paper carrier. The food was lovely and the staff friendly. The service was however chaotic and I had to ask for the complimentary prosecco for my mum which the staff where puzzled about even though it was advertised in my booking and confirmation. We had to ask a few times for refills of tea. The environment was nice but I wasn't a fan of the music. We went for a Mother's day treat, understandably it was very busy, but the service was patchy, we had to wait 15/20 minutes for top up tea we asked for and had to ask twice. One waiter was very friendly, another very indifferent. Given that they knew how many bookings they had they might have been better prepared. The food was excellent though. It was not as enjoyable or as relaxing as I would have liked due to the service and the overbearing DJ music - I asked if this could be turned down a bit but was ignored. 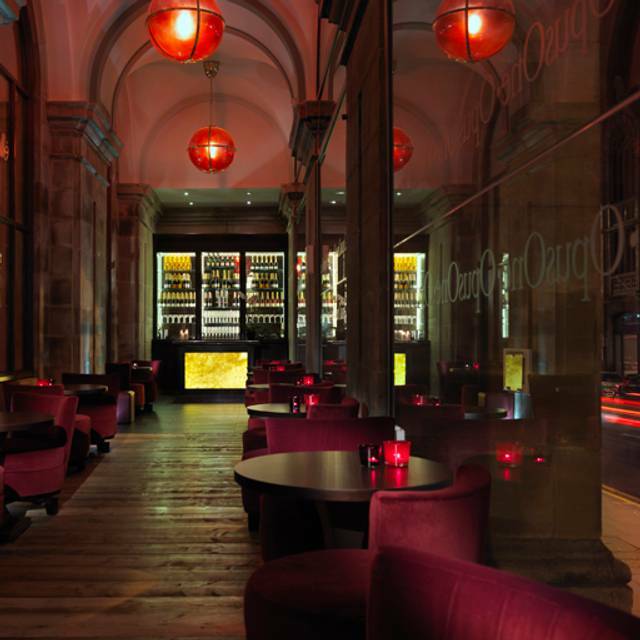 Lovely and relaxing.The service was excellent and very inobtrusive. The welcome was fantastic and we were shown to our table and given a menu as soon as we arrived. The menu was explained well and we ordered a glass of champagne while we waited for the afternoon tea to arrive. The sandwiches were tasty (if slightly dry) and the cake selection was superb especially the strawberry shortcake, however the scones were terrible- small, dry and clagey which left a strange after taste and were difficult to swallow. The scones should be the highlight of the occasion but these were truly awful, which was a shame as everything else especially the service was first class. We enjoyed the food, nice choice of sandwiches and lovely cakes. 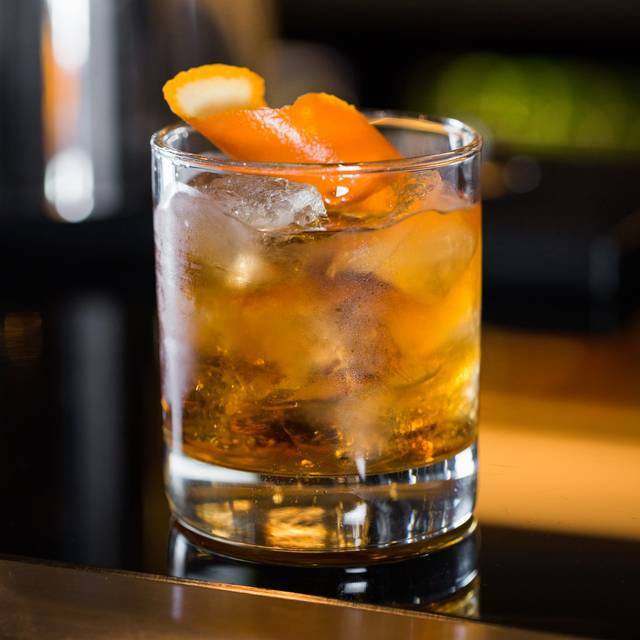 However the service was very poor, servers were inattentive and needed to be asked several time when we needed anything. Music level was such that you could not carry out a decent conversation. Disappointed as this was a special celebration. Will not be attempting a return visit. Welcomed with friendliness we were early and sat in the bar area..We were taken to our table promptly and made to feel very comfortable. Afternoon tea served, sandwiches were very nice enjoyed the fillings, good choice of cakes and scones It was a 70th birthday celebration for my husband and we were treated to a glass of Champagne. The service was excellent although there was a change over in staff during the time we were there,nothing was too much trouble. No hesitation in recommending Afternoon Tea here..
Me and my sister went to the raddisson for afternoon tea we have been many times before and was always perfect but this time it was different the after tea was poor and that’s being nice the sandwiches were bland tasteless the cheese one was just soggy the scones were horrible and no option of a plain scone the cakes at the top were soft and soggy too and the hazelnut cake was to dense we definitely will not be going back as it was a disappointment and we paid £66 which was definitely not worth it. This has changed since I last visited. No more gentleman’s afternoon tea. Worst is they have modernised the decor with uncomfortable seating and layout. Less private and loud music playing. Not the experience you’d expect from afternoon tea. Afternoon Tea at the Radisson Edwardian was excellent. plenty of food, unlimited tea, coffee, hot chocolate. The service was great and the hotel and resteraunt lovely. I treated my mum for her birthday afternoon tea. The staff were very welcoming and attentive. I would definitely return. We could not finish the cakes as we were so full!! Absolutely gorgeous room, really friendly staff and the food was plentiful. Will definitely go again, may even stay over! We've visited before for afternoon tea and had a much better experience. I find it difficult to pay £28 for afternoon tea for a child but they now no longer provided a child's afternoon tea. The menu had changed since I booked and the sandwiches were very strong flavours which meant we didn't eat all our food. The cakes were lovely and the scones delicious. It's disappointing that there isn't a festive themed afternoon tea at this time of year. This was our third visit to the Radisson Blu for afternoon tea. On the two previous occasions we had initially, The Manchester afternoon tea and on the second occasion this was called the gentleman’s afternoon tea. This time we were told there was only the traditional afternoon tea. I have to say that the sandwiches were pretty nondescript and rather tasteless. Two scones per person, one of which was chocolate chip. With jam and cream!!!! Plus four very sweet patisseries. Sugar overload. We couldn’t eat all of these, so they were put in a box to bring home. Whilst the staff were attentive, apparently we were entered as a no show and received an e.mail intimating such, when we had spent £152.00 this was rather galling on top of the fact that the food was lacking the previous deliciousness of the previous two visits. Won’t be returning.Sadly. This is our third visit, however there was a savoury option on previous occasions. This would have been our preferred choice. Too many cakes and it enough sandwiches for two of the partys pallets. My partner and myself visited for afternoon tea. We had been for afternoon tea here before it changed it's name and concept. We hadn't been told it had changed when we booked. Last time it was exquisite, great decor, fabulous staff, comfortable and delicious. Why change a winning combination? Two lovely friendly ladies greeted us and showed us to our table. On the way to our table we noticed a drastic change in the decor, all modern and rough wood on the panelled room dividers. We were shown to our table, sat on low sofas, nightmare! My partner has had a knee replacement and I knew he would be uncomfortable. Very, very small round tables. Not a clever idea for afternoon tea! We ordered our tea and food, I asked for a vegetarian afternoon tea. The waiter left to place the order. We waited 35 MINUTES for our pot of tea. Really? It wasn't even busy. We had drank our tea before the food arrived and asked for more. As we were having separate food there was no space on the table for 2 afternoon tea trays. Why are the tables so small? I had asked for vegetarian meal but never in a million years expected what I got. 4 finger slices of bread, two with a bit of lettuce and half a slice of tomato. I was gobsmacked. Is there no imagination off the chefs for vegetarians? I asked to send it back and replace with something better. My partner was happy with his food. 15 minutes later the waiter returned with a fresh plate of finger sandwiches. 4 MEAT sandwiches was what they had sent. I was gobsmacked at the lack of attention to detail. It used to be such a great place. Eventually the chef did come out of the kitchen and ask me what I wanted. He returned with some nice avocado and cheese sandwiches, still got one with just lettuce on but I was worn out and could not be bothered sayng anything. We just wanted to leave by this point. A disastrous experience, they will need to up their game to compete with some of the amazing restaurants in the area. We walked in and was seated by a waitress who could not articulate what the menu was but was nice enough. Ordered our afternoon, one member was Vegetarian but they were happy to accommodate. (they no longer do Gentleman's Tea). Some 20 minutes later we were still awaiting service and had not even had our teas and coffees. The waitress explained that she had placed our order twice and would chase this up. When the Tea eventually came it was cold. The afternoon tea was poor to say the least. The menu advised "choose from four finger sandwiches" ...not unless your finger is a twig! The sandwiches were were literally half a sandwich cut into four pieces and the bread was soggie and wet! When we advised the staff of this they said they would bring more sandwiches. These too were wet (this is after waiting a further 15 minutes). There was only two other tables in the restaurant so to wait 45 minutes for the afternoon tea is shocking. We had picked this venue to celebrate my mum's special birthday with family as we had been here before and liked the food and but the quality and service has deteriorated and for £30.00 per person it is simply a rip off! Don't bother going here choose somewhere that has quality service and top food!! Historic building on the outside, mainly modern decor on the inside. 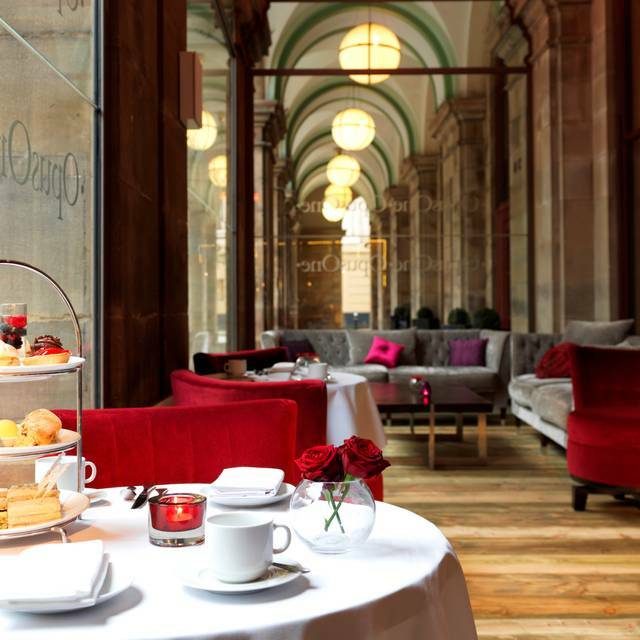 Ask for a window seat if you would prefer a quiet, comfortable spot; perfect for Afternoon Tea. Their sandwich selection was ok; could expand on the choices and serve on artisan bread instead of pre-sliced supermarket variety. Scones and preserves were delicious, not overly sweet. The pâtisseries selection was too sweet, especially English strawberry shortbread. Standard coffee and tea selection; could offer more choices. We had afternoon tea as a Xmas present. The lovely restaurant was rather spoiled by the constant drilling next door. The tea selection could have been more imaginative but what I had was lovely. The food was good although we would have preferred more savoury items perhaps replacing the very dry scones. Quite a sugar overload. All round a very pleasant afternoon. Unfortunately we were put in a different room for afternoon tea whilst works were being carried out. As This was a gift nearing its expiry and we didn't know about the works we couldn't wait & book it for a later date. This was a very plain room with white walls tables & chair covers too formal if anything. There was only the 2 of us & a group of maybe 6/7 on the table behind us and a table of 2 just finishing when we arrived so plenty of empty tables. We felt watched with staff standing around 3 together at one point & as we finished the bottom tier of sandwiches it was quickly removed from the stand. The afternoon tea arrived as you would expect nicely presented. The scones were lovely slightly warm, the cakes though looked lovely were too sickly. We were underwhelmed by the lack of filling in all the sandwiches, with wafer thin ham & the cheese & onion ones were thinly spread cheese & lots of chopped red onion. We didnt have the beef or salmon sandwiches. They kindly accommodated us by making egg sandwiches but again only a smattering of filling in thuem. Once the refurbishments are completed I'm sure the surroundings will improve the overall experience. Did not honour the £50 for two deal as advertised with prosecco. Food lukewarm, chips undercooked, pies hardly any filling, chicken slider dry, sandwiches not freshly made. Gorgeous afternoon tea, can’t fault the food. Not keen on the 10% service charge that didn’t seem to be optional however. Our booked table was given to someone else upon arrival, shown to another table, then forget about for 15 minutes, I had to go and ask for service (and table to be laid), bit of a let down considering I had stated it was a special birthday. However after the bad start all was good. The food was lovely but the service very poor. We had to wait for the tea area to be cleaned, wait to be acknowledged by staff and shown to our table, then wait for the food. As they give you a set amount of time for the table a lot of this was taken up with waiting. After when we ordered more tea one pot came with a tea bag in and the other was different tea than we had asked for. I was really disappointed with the afternoon my husband and myself booked for our wedding anniversary. We ordered 1 normal and 1 gentleman's afternoon tea as recommended by the waitress suggesting we would then get 2 of everything and be able to share! We were swiftly brought 2 plain afternoon tea's with 2 of everything we were slightly confused by this and tried to get the waiters attention to check if they had our order correct but he had disappeared at which point my husband who was starving picked up a sandwich to eat just as the waiter reappeared explained there had been a mix up with our order and took all the food away from us. Only to come back some 15mins later with what we had actually ordered. In my opinion as it was their mistake and my husband had already touched the food it should have been left with us until the gentlemen's afternoon tea arrived. as for the food the cakes and scones were delicious however the sandwiches were either bland or had a very strange taste (our ham sandwich tasted of banana) and cream cheese and red onion was disgusting! The fish and chips all batter and hardly any fish and 1 chip each which was raw, again the chicken burger tasty when you got some burger but it was mostly bread and the mini steak pie was quite bland we were both extremely disappointed in fact my husband said it was the worst afternoon tea he had ever had. We and our friends enjoyed the occasion and your staff were very attentive and friendly.